Between 1933 and 1939, representations of the Nazis and the full meaning of Nazism came slowly to Hollywood, growing more distinct and ominous only as the decade wore on. “Excerpted from Hollywood and Hitler, 1933-1939 (footnotes omitted), by Thomas Doherty. Copyright © 2013 Columbia University Press. Used by arrangement with the publisher. All rights reserved.” No part of this excerpt may be reproduced or printed without permission in writing from the publisher. Hollywood first confronted Nazism when a mob of brownshirts barged into a motion picture theater and trashed a film screening—a resonant enough curtain-raiser, if a bit heavy-handed on symbolism. 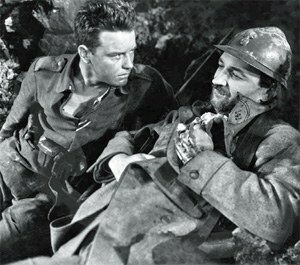 On December 4, 1930, All Quiet on the Western Front (1930), Universal Pictures’ spectacular screen version of the international best seller by Erich Maria Remarque, premiered at the Mozart Hall, a showpiece venue in Berlin, the true capital of the Weimar Republic, the democratic federation founded in 1920 and hanging on by a slim thread ten years later. The antiwar epic was the first must-see film, not starring Al Jolson, of the early sound era. Only a few years earlier, Jolson had shattered the mute solemnity of the silent screen with the soulful racket of The Jazz Singer (1927), a technological marvel and cultural bellwether about an ethnic, religious, and racial chameleon—a Jewish boy in blackface—who hits the big time in America, actually becomes American, by singing jazz and shaking his hips on the Broadway stage. Only the clash of ignorant armies filled the soundtrack of All Quiet on the Western Front. Directed by Lewis Milestone, a Russian-born veteran of the U.S. Army Signal Corps, the somber death march kept faith with Remarque’s bitter perspective on the Great War, a wrenching tale of blithe cannon fodder led to the slaughter by dreams of glory and the lies of cynical old men. The film won top honors from a professional guild founded just two years earlier, the Academy of Motion Picture Arts and Sciences, garnering a pair of trophies not yet dubbed Oscar for Best Director and Best Production. Remarque’s sentiments were shared by most of the people so lately in each other’s crosshairs: the real enemy was war, not Germany, England, or France, still less the United States, a tardy combatant who had emerged from the bloodbath relatively unscathed, the body count for its entire hitch in service not matching the deaths suffered by the British, French, and Germans at the Somme, or Verdun, or Pachendale. With a presold story and a heartfelt message, the international market for what critics and audiences alike hailed as a cinematic masterpiece seemed auspicious, nowhere more so than in Germany, the war-ravaged home of the author. Yet since the January 1929 publication of Remarque’s novel, a bildungsroman steeped in the antiwar atmospherics of the Weimar Republic, a rival zeitgeist had swept over Germany. Led by a former corporal on the Western front, the most extreme of the right-wing militarist groups continued to fight for a noble cause lost only because the gallant warriors had been stabbed in the back by the Armistice of November 11, 1918, and crushed underfoot by the Versailles Treaty. For the Nazis, the Great War remained a festering wound and a powerful recruitment tool. The party’s paramilitary wing, the Sturmabteilung (storm troopers, or S.A.)—street thugs known by the brown color of their uniform—stood ready to do battle, Armistice or not. Anticipating a turbulent reception in Germany, Universal tried to head off trouble by soliciting prior clearance from Baron Otto von Hentig, the German consul general in San Francisco, who flew down to Los Angeles for a private screening at Universal Pictures. Under his editorial guidance, and with the approval of the German Chargé d’Affaires in Washington, D.C., Universal prepared a special print for German release, sanitizing the stench of life in the trenches—the foul mud, the rancid food, the vulgar griping—and muting the antiwar rhetoric, notably a patch of dialogue blaming the Kaiser for the war. On November 22, 1930, given the go-ahead from the foreign office, the German censors in Berlin cleared All Quiet on the Western Front for exhibition in the nation that had inspired the source material. The first public screening in Berlin augured well. Mirroring the reactions of American, British, and French audiences, the opening-night crowd at the Mozart Hall watched in quiet reverie. After all, like the book, the film was a deeply German story: of a patriotic young Gymnasium student, blazing with fervor for the Fatherland, who marches into carnage, disillusionment, and ultimately, inevitably, death, felled by a sniper’s bullet as he reaches over a parapet to touch a fluttering butterfly. The final image plays taps for the dead on all sides: a double exposure of fresh-faced, smiling recruits, looking back into the camera, not accusingly, just oblivious to what awaits them, over a field of graveyard crosses. In fact, the first day’s screening was uneventful; the police, tipped off to the potential for violence, had come out in force. The next day, however, the authorities let down their guard, or perhaps looked away. Led by Dr. Paul Joseph Goebbels, the media impresario for the Nazi Party, a cadre of burly brownshirts had infiltrated the theater’s interior. As the film unspooled, the Nazis stood up and howled invective at the screen, railing against the perfidy of the Hollywood Jews who had bankrolled this slur on German honor. Above the din, a shrill epithet rang out. “Judenfilm!” screeched Goebbels. “Judenfilm!” Along with the rhetoric, other noxious elements—stink bombs and sneezing powder—permeated the air, and white mice, released at the same time, scurried down the aisles. As patrons gagged and women stood on their seats screaming, the management was forced to stop the show and clear the house. Amid the chaos, several moviegoers, taken for Jews by the brownshirts, were savagely beaten. “Within ten minutes, the cinema was a madhouse,” Goebbels gloated in his diary that night. “The police are powerless. The embittered masses are violently against the Jews.” Over the next evenings, Goebbels mounted a series of nighttime rallies and torchlit parades to protest All Quiet on the Western Front. Assembling in the nearby Nollendorf Plaza, hordes of brownshirts, with Goebbels in the lead, descended on the Mozart Hall and demanded that the theater doors be shuttered and the film print destroyed. As similar riots erupted across Germany, Dr. Alfred Hugenburg, owner of Ufa, Germany’s flagship motion picture studio, beseeched President Paul von Hindenburg, the geriatric leader of the wheezing Weimar Republic, to revoke the permit for exhibition issued by the German film censors. The German Motion Picture Theater Owners passed a resolution refusing to exhibit All Quiet on the Western Front and regretting “exceedingly that Carl Laemmle, a German-American, should present, twelve years after the war, a war film in which the German version differs from those shown throughout the world.” That is, after insisting on alterations in the original American version for the German release, the Germans now objected to the alterations. Carl Laemmle, president and founder of Universal Pictures, was indeed a native son of Germany, but his national heritage was not the problem. Born in 1867 in the municipality of Laupheim, in the blue Danube district of Württemberg, Germany, he was the son of precariously bourgeois Jewish merchants, Julius and Rebekka Laemmle. At seventeen, he immigrated to America to live out a scenario scripted by Benjamin Franklin: up the ladder a rung at a time, working hard, living modestly, and keeping an eye out for the main chance, rising from $4-a-week messenger, to clerk, to store manager, to store owner. In 1906, Laemmle moved to Chicago with plans to invest his savings in a five-and-dime store—until he noticed a long line of customers, nickels in hand, waiting to enter a storefront to gawk at the entertainment revolution launched with the new century. Opening his own nickelodeon, Laemmle got in on the ground floor of a business that would never again be small change. As an exhibitor, he needed a reliable film broker, so he expanded into distribution. As a distributor, he needed a steady stream of product, so he moved into production—financing his own films and fighting the monopolistic film trusts that controlled the supply chain. In 1912, flush with an infusion of cash from a white-slavery exposé entitled Traffic in Souls (1912), he transferred his operation to the city soon to become synonymous with the budding industry, opening the first Universal Pictures in an old brewery on the corner of Sunset Boulevard and Gower Street. On March 15, 1915, he expanded the operation to a 230-acre lot in the San Fernando Valley and christened the grounds Universal City—already declaring his global aspirations for the universal medium. As Laemmle built his American dream factory, he maintained warm kinship ties and close commercial links with his native Germany, frequently vacationing there and mixing business and pleasure with his extended family. In 1920, returning to Germany for the first time since the Great War, he was heartsick at the appalling destitution in a once prosperous land. Taking to the pages of the Saturday Evening Post, he made impassioned pleas for the fortunate people of America to relieve the sufferings of the stricken people of Germany. “Possibly many of you haven’t forgotten the war and maybe some hatred still lingers in your hearts, yet it is an American trait to forget and forgive, to soften and sympathize, when real distress steps over the threshold,” he wrote, imploring his readers to give aid and comfort to their former enemy—not the bestial Hun leering from the Great War propaganda posters but fellow human beings in desperate need of relief. “Will you send me any kind of help you can afford—food, clothing, hats, shoes, money?” he begged. “All the employees of Universal are contributing and weekly we are sending cases of supplies to Germany.” Laemmle paid the shipping costs for the donations out of his own pocket. A product of late-nineteenth-century Germany, Laemmle was a generation and a culture removed from the newer Jewish arrivals in Hollywood, descendants of Eastern European and Russian Jews mostly, who occupied the executive suites of his rivals at Warner Bros., MGM, Paramount, and Fox. An avuncular figure known—universally—as “Uncle Carl,” he had a weakness for the ponies (he was a regular at the racetrack at Santa Anita) and poker (he wryly described himself as “the unluckiest poker player in the United States,” knowing how lucky he was in other ways). If Laemmle adhered to any stereotype, it was the stock image of the kindly German burgher—white-haired, well-fed, and warm-hearted.